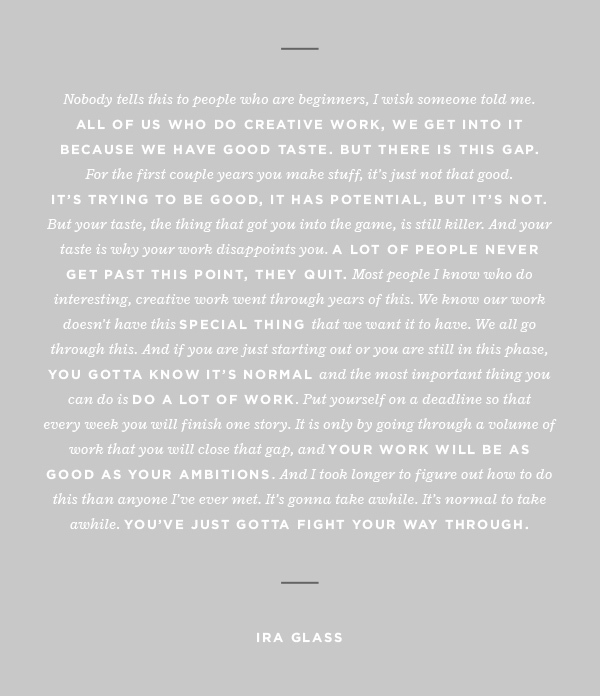 I've come across this quote by Ira Glass before, but lately I keep coming back to it. If any of you reading are also creatives, I'm sure you've wrestled with the above issue. It's been on my mind a lot lately as I work through some freelance work and simultaneously try to better myself as a designer. I often have a hard time getting to work because I feel like nothing I create will be as good as a I envision or want it to be. Such is a perfectionist's life. I'm making a pact with myself to remind myself of this everyday and encourage me to do more work, no matter how bad or good it is. It's so important to remind yourself that no one woke up being amazing. Behind their seemingly perfect work is tons of failed pieces, tons of bad solutions. So keep your head down, stop the comparisons and just do you.